Don’t Slow Down! Continue to Fight for the Cure with the Passionately Pink for the Cure Team! Breast cancer has touched my family's life deeply, for my mother-in-law, Jannell Cleaver, died from this illness back in 2003. Because cancer took away Michael's mother so soon, she never had the chance to see my husband and I get married, visit us in our first home we bought together or ever meet her wonderful granddaughter. In order to do my part to raise money for the Susan G. Komen Passionately Pink for the Cure charity, I've joined forces with the Scholastic Parent & Child Passionately Pink for the Cure team. Remember, you still have until December 31st, 2011 to WIN ONE OF TWO $100 AMEX GIFT CARDS! Please join me by continuing to "THINK PINK" and donate to the Mommies Living the Life of PINK! team today! 3 Responses to Don’t Slow Down! Continue to Fight for the Cure with the Passionately Pink for the Cure Team! Let us all support this. This is a great news for all who suffers from cancer. The diagnosing will surely be a blessing to all patients. Its great that they help men and women who have this kind of illness. Hi Melissa! I would like to see changes after a while. Please let me know. Thanks a lot. 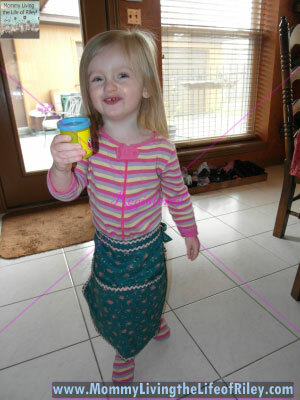 Wordless Wednesday ~ I Knew My Daughter Would Try and Wear My Clothes…But This Soon?? ?